In the run-up to the new season, Bayern Munich may have been tipped favorites for the title, but they did little to prove why in their season-opener on Saturday. 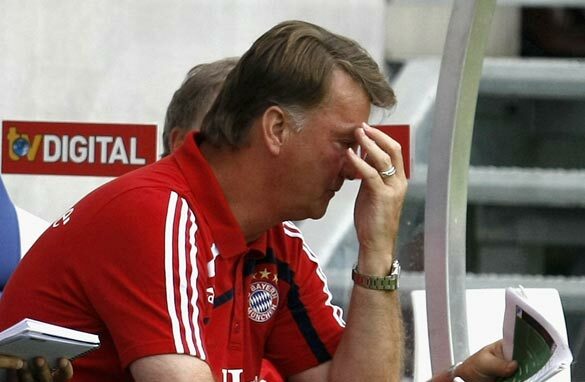 Worried Bayern coach Louis van Gaal watches his side's Bundesliga opener. After their second trophy-less season in three years, Bayern decided to spend big (by Bundesliga standards at least) and splashed out over $70 million on new recruits – all the while failing to cover the side’s weak spots in defense and goal. Bayern Munich President, Franz Beckenbauer, has called the team “the best Bayern squad of all time”. But the team’s performance on Saturday painted a different picture. Playing away to Hoffenheim, a side entering just their second season in the German top flight, Bayern appeared to struggle for long periods of the game. Hoffenheim should have gone ahead early on – if it weren’t for a glaring mistake from the referee. The visitors’ only goal came against the run of play, with Hoffenheim pulling one back not too long after. In short, the hosts were fresher, faster and more fired-up. Bayern may have improved in the second half, but they were fortunate to come away with a point at all. Some might argue the Bavarians were bound to be below-par due to the absence of injured playmaker Franck Ribery, and strikers Luca Toni and Miroslav Klose. But with the transfer window still open – and other clubs keenly eyeing-up both Ribery and Toni – their absence could yet become a permanent fixture. Since his arrival at the club, Ribery’s presence on the pitch has been pivotal to the club’s success. The French playmaker has been one of the hot topics on this summer’s transfer markets, and Europe’s top clubs have all shown an interest. Bayern insist he’s not for sale, but rumors persist. The club could be left with little choice if Ribery hands in a transfer request – once he’s picked up his Bayern loyalty bonus on August 14th, of course. The Bavarians’ top scorer for the last two seasons, Luca Toni, could also be on his way out of the Bundesliga. Premier league sides West Ham and Tottenham Hotspur are both said to be lining up to start the bidding. Out of favor with coach Louis van Gaal, but a personal friend of West Ham manager Gianfranco Zola, his departure looks to be a near certainty. After signing striker Mario Gomez, a prolific scorer in the Bundesliga for former club Stuttgart, Bayern aren’t likely to be too concerned. But Gomez still has to prove he can perform when the stage is bigger and the pressure greater. At his first opportunity, he made a less than convincing start. Ahead of the season-opener, van Gaal said his side will need time to find its best form this season. Saturday proved him right. What does Beckenbauer means best bayern squad of all time,i think beckenbauer should look again while Fcbayern need two more playmaker,Van Gaal it will all fall back to you,pls think. Wth lucio and zee roberto gone,bayern had made the biggest mistake in their history.bayern should let van gaal go too before its too late,otherwise they will not even qualify for uefa. German football is charging,so sorry Sir van gaal,you will go now or later!